Sign up for our FREE daily news service to get the latest helicopter industry headlines sent directly to your inbox. The new Airbus H145, flying the Sikorsky Autonomous Research Aircraft, South Africa’s first civilian Black Hawk operator & more! Sign up for your free Digital Alert from Vertical and Vertical911 magazines. Sign up for free daily email updates from the helicopter industry’s top news source. For more than a decade, our flagship magazine, Vertical, has been the helicopter industry’s No. 1 source for timely news, reporting from the field, and spectacular photography. Featuring award-winning content and contributors, Vertical provides the best coverage in the industry. 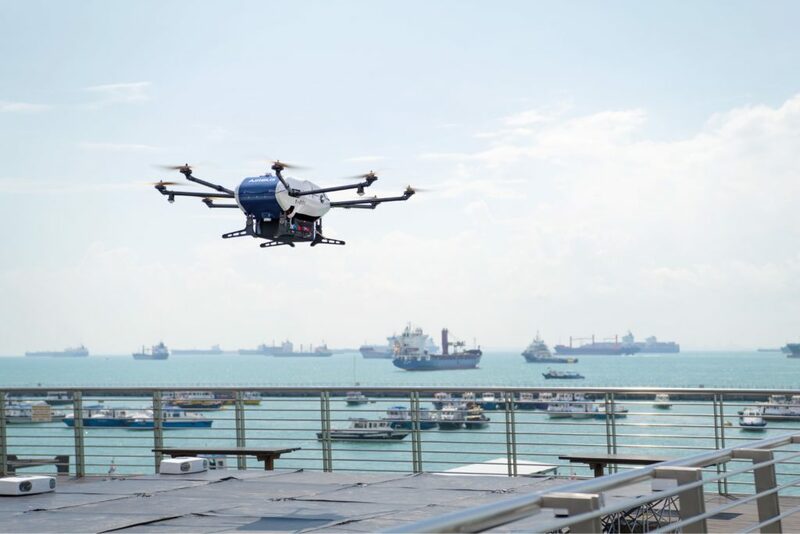 Airbus has begun shore-to-ship trials in Singapore with its Skyways parcel delivery drone. This marks the first time drone technology has been deployed in real port conditions to deliver a variety of small, time-critical maritime essentials to working vessels at anchorage. The maiden shore-to-ship delivery flight was made to the Swire Pacific Offshore’s Anchor Handling Tug Supply vessel ‘M/V Pacific Centurion’, 1.5 kilometers (km) from the shoreline of Singapore’s Marina South Pier, carrying 1.5 kilograms (kg) of 3D printed consumables. Landing safely on the ship deck and depositing its cargo to the shipmaster, the Skyways unmanned air vehicle (UAV) swiftly returned to its base, with the entire flight taking within 10 minutes. The trials are being undertaken in conjunction with partner Wilhelmsen Ships Services (Wilhelmsen), one of the world’s leading maritime logistics and port services company. During the trials, Airbus’ Skyways drone will lift off from the pier with a payload capability of up to 4kg, and navigate autonomously along pre-determined ‘aerial corridors’ to vessels as far as 3km from the coast. “We are also happy to be taking a step forward for Airbus’ urban air mobility endeavour, as we continue to explore and seek better understanding of what it takes to fly safe and reliable autonomous flying vehicles safely,” added Jeoh. “The now proven, seamless operation of drone deliveries from shore to ship, in one of the world’s busiest ports proves the hard work, investment and faith we, and indeed our partners, placed in the Agency by Air project over the past two years was not misplaced,” said Marius Johansen, vice president Commercial, Ships Agency at Wilhelmsen. “Delivery of essential spares, medical supplies and cash to master via launch boat, is an established part of our portfolio of husbandry services, which we provide day in and day out, in ports all over the world. Modern technology such as the unmanned aircraft systems, are just a new tool, albeit a very cool one, with which we can push our industry ever forward and improve how we serve our customers,” said Johansen. 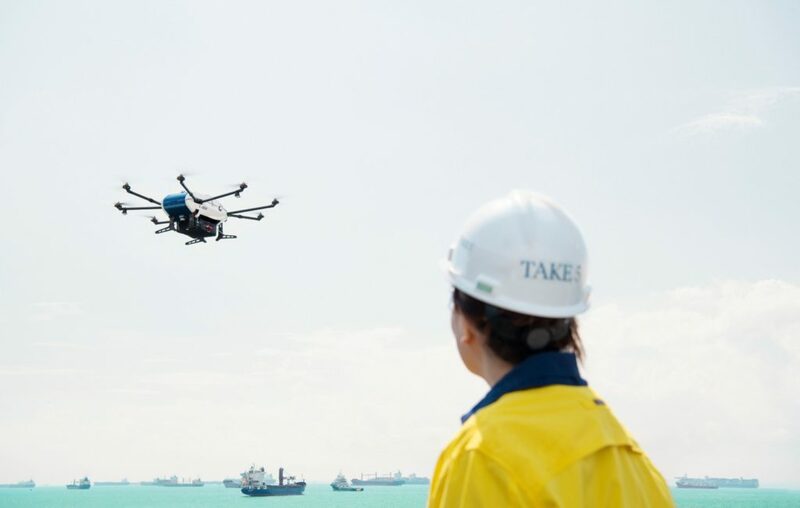 The use of unmanned aircraft systems (UAS) in the maritime industry paves the way for possible enlargement of existing ship agency services’ portfolio, speeding up deliveries by up to six times, lowering delivery costs by up to 90 percent, reducing carbon footprint, and significantly mitigating risks of accidents associated with launch-boat deliveries. Airbus and Wilhelmsen signed an agreement in June 2018 to drive the development of an end-to-end unmanned aircraft system for safe shore-to-ship deliveries. The collaboration marries Airbus’ extensive expertise in aeronautical vertical lift solutions and Wilhelmsen’s wealth of experience in ship agency services. A landing platform and control centre was set up at the Marina South Pier in November 2018, through the facilitation of the Maritime and Port Authority of Singapore. The maritime agency also designated anchorages for vessels to anchor off the pier for the trials, while the Civil Aviation Authority of Singapore worked with Airbus and Wilhelmsen to ensure safety of the trials. Skyways is an experimental project aimed at establishing seamless multi-modal transportation networks in smart cities. Through Skyways, Airbus aims to develop an unmanned airborne infrastructure solution and address the sustainability and efficiency of unmanned aircraft in large urban and maritime environments. Having demonstrated the ability to deliver parcels safely and reliably to vessels anchored off the coast of Singapore, Skyways will soon be commencing another trial phase delivering air parcels autonomously in an urban environment, at the National University of Singapore. Receive daily updates from around the helicopter industry right in the palm of your hand with Vertical Daily News.